UPDATE: A 38-year-old Bronx man admitted robbing a Fort Lee bank of $50,000 with a large knife in January. 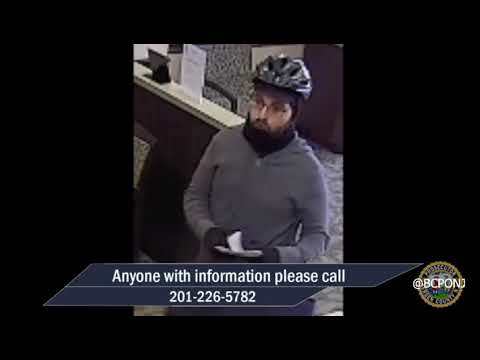 FORT LEE, N.J. -- A 38-year-old Bronx man who robbed a Fort Lee bank of $50,000 with a large knife last week was scheduled for a first federal court appearance Thursday, authorities said. Andres Dominguez, 38, is charged with one count of bank robbery and is scheduled to make his initial appearance before U.S. Magistrate Judge James B. Clark III in Newark, U.S. Attorney Paul J. Fishman announced Wednesday afternoon. Dominguez was wearing a gray Nike hooded sweatshirt, a blue rubber glove, sunglasses, a wool hat, black Adidas pants, and white sneakers when he entered the Bank of New Jersey branch on Palisade Avenue around 3 p.m. Thursday, Fishman said. He "approached one of the bank tellers with a large kitchen knife in his right hand and jumped onto the counter separating the tellers from customers," the U.S. Attorney said. "He then demanded money from the teller and instructed the teller to give him all the money in the teller drawers or he would kill her. "The teller complied, and the robber jumped back over the counter and fled the bank on foot," Fishman said, adding: "The robber was later identified as Dominguez." Authorities recovered the knife from a dumpster behind the bank, the U.S. Attorney said. They also found two blue rubber gloves, a gray Nike hooded sweatshirt, and a dark wool hat on the street at various locations within a few blocks of the bank, he said. The FBI and Fort Lee police arrested Dominguez in the Bronx on Friday. Fishman credited the FBI with the investigation and arrest. He also thanked Fort Lee police. Handling the prosecution will be Assistant U.S. Attorney Jason S. Gould of Fishman's General Crimes Unit in Newark.